Lawn Watering Schedule | Fairway Green Inc.
Summer is in full swing and the warm weather makes it perfect to enjoy your outdoor living space. Unfortunately, the same warm weather and lack of rain can really stress your lawn. 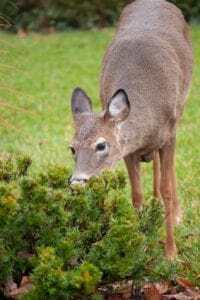 Maintaining a lawn and landscape takes a lot of work and effort, but there are few cultural practices that are important to keep your lawn looking great throughout the summer. In addition to following our mowing best practices, another summer cultural practice that will greatly improve the look of your lawn is to implement a lawn watering schedule. When executing a lawn watering schedule, we highly stress sticking to a schedule. Rotating between watering and not watering can weaken the glass plant. Additionally, these recommendations are for the soil types with a considerable amount of clay in them. For sandy soil, the watering recommendation will be completely different. 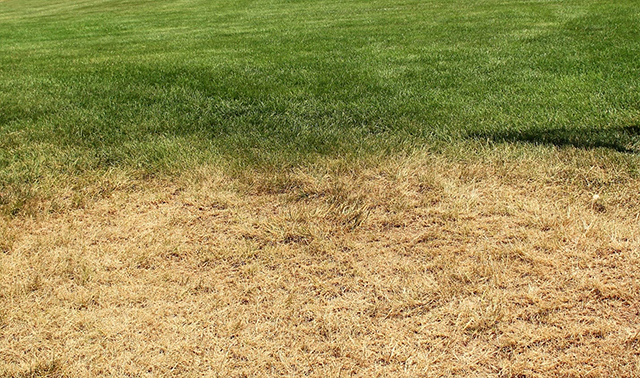 This image captures the difference between a lawn properly watered and a dormant lawn. The best time to water your lawn is between the hours of 12 am and 6 am. This helps minimize water loss to evaporation because this time of the day is often cooler and more humid. This also allows the water to penetrate deeper into the soil and minimizes the length of time the grass blades remain wet, since the blades will already be covered in dew. This helps reduce the susceptibility for turf diseases. We recommend watering your lawn like a heavy rainstorm; putting a lot of water down at once! It is important to water in a way that will reach the depth of the turf’s root system. A good starting point in our area is to provide 1 inch of water per week. For underground irrigation systems, you want to have your system set to run 1 – 1 ½ hours twice a week. If you have hose-end sprinklers, we recommend purchasing a valve timer and setting your sprinkler to run for 4 hours, once per week. These run times are approximations to get you to 1 inch of water per week, the timing may vary slightly depending on the type of sprinklers installed. If your following the watering schedule and your soil is still drying out and you notice browning, try adding an extra half hour of run time to each zone. Always start by adding time to the current watering schedule, rather than adding another day. Frequent and short watering (15 minutes per zone everyday) is not a good lawn watering schedule. It will promote a shallow root system which can weaken the grass plant and encourages disease. Unfortunately, this is something we come across quite often. Deep, infrequent watering is recommended and will help create a deeper root system, resulting in a stronger grass plant. 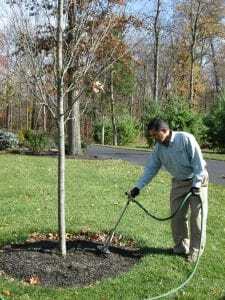 Once a lawn goes dormant, it will take a few weeks of good watering for the grass to exit dormancy. Therefore, it is important to start watering early in the year and not stop. If you keep up with the watering schedule, your turf will have plenty of moisture over the entire summer. Summer is a great time to spend outside but can be very stressful on your lawn. Following a few cultural best practices can really make a difference when it comes to having a healthy lawn all summer long. If you have any questions about summer cultural practices or want more information about a lawn watering schedule, please request an online estimate or give our office a call at 908-281-7888.